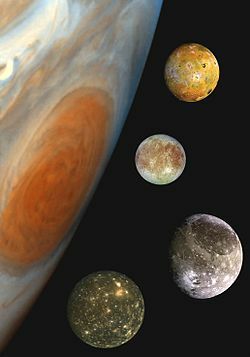 The Galilean moons are the four satellites of Jupiter found by Galileo Galilei: Io, Europa, Ganymede, and Callisto. They are by far the biggest of the many moons of Jupiter. Galileo Galilei found what came to be known as the Galilean moons around December 1609 or January 1610. As a result of improvements he made to the telescope, Galileo was able to see celestial bodies better than ever before in human history. Using his improved telescope, Galileo was the first to see four moons of Jupiter. On January 7, 1610, Galileo wrote a letter containing the first mention of Jupiter’s moons. At the time, he only saw three of them, and he believed them to be fixed stars near Jupiter. He continued to look at them from January 8 through March 2. In these observations, he found a fourth body, and also observed that the four were not fixed stars, but rather were orbiting Jupiter. Galileo Galilei, the discoverer of the 4 Galilean moons. Galileo’s discovery proved the importance of the telescope as a tool for astronomers. It showed there were objects in space to be found, which were not seen by the naked eye. More importantly, the discovery of celestial bodies orbiting something other than the Earth dealt a blow to the then-accepted Ptolemaic world system. This held that the Earth was at the center of the universe and all other celestial bodies revolved around it. That Jupiter has four moons while Earth has only one further undercut the near-universal belief that the Earth was the center of the universe both in position and in importance. Galileo's Sidereus Nuncius (Starry Messenger), which announced celestial observations through his telescope, does not mention Copernican heliocentrism, a theory that placed the Sun at the center of the universe. Nevertheless, Galileo believed in the Copernican theory. Galileo also developed a method of determining longitude based on the timing of the orbits of the Galilean moons. A Chinese historian of astronomy claims that Chinese astronomer Gan De observed one of Jupiter's moons in 362 BC, but without a telescope it is difficult to see how this was done. Galileo called his discovery the Cosmica Sidera ('Cosimo's stars'), in honour of Cosimo II de' Medici (1590–1621), grand-duke of Tuscany, whose patronage he wanted. At the grand-duke's suggestion, Galileo changed the name to Medicea Sidera ('the Medici stars'), honouring all four Medici brothers (Cosimo, Francesco, Carlo, and Lorenzo). The discovery was announced in the Sidereus Nuncius ('Starry Messenger'), published in Venice in March 1610, less than two months after the first observations. Other names put forward, but the names which eventually prevailed were chosen by Simon Marius. Marius claimed to have found the moons at the same time as Galileo: he named them after lovers of the god Zeus (the Greek equivalent of Jupiter): Io, Europa, Ganymede and Callisto, in his Mundus Jovialis, published in 1614. Galileo refused to use Marius's names and invented the numbering scheme that is still used nowadays, in parallel with proper moon names. The numbers run from Jupiter outward, thus I, II, III and IV for Io, Europa, Ganymede and Callisto respectively. Galileo used this system in his notebooks but never actually published it. All four Galilean moons are bright enough that they could, if they were farther away from Jupiter, be seen without a telescope. They have apparent magnitudes between 4.6 and 5.6 when Jupiter is in opposition with the Sun, and about one unit of magnitude dimmer when Jupiter is in conjunction. The main thing that is hard in observing them is due to the fact that they are very close to Jupiter, and are masked by its brightness. Their maximum angular separations from Jupiter are between 2 and 8 minutes of arc, close to the limit of human visual acuity. Ganymede and Callisto, at their maximum separation, are the likeliest targets for possible naked-eye observation. The easiest way to observe them is to cover Jupiter with an object, e.g. a tree limb or a power line that is perpendicular to the plane of moons' orbits. ↑ Galilei, Galileo, Sidereus Nuncius. Translated and prefaced by Albert Van Helden. Chicago & London: University of Chicago Press 1989, 14-16. ↑ 2.0 2.1 Galilei/Helden, 15-16. ↑ Xi Zezong 1982. "The discovery of Jupiter's satellite made by Gan De 2000 years before Galileo," Chinese Physics 2: 664-667. This page was last changed on 6 April 2015, at 19:58.